Transnational Corporations have not ‘let a good crisis go to waste’. There was precious little debate in the House of Commons, let alone in the country, prior to the Major government signing up to the 8th round of the GATT (General Agreement on Trade and Tariffs) treaty in Uruguay in 1994. This treaty extended the scope of the previous one beyond manufactured goods to cover services, agriculture and intellectual property, including services such as health, education and other public provision, and environmental ones such as GM foods, nuclear power and agribusiness. Implicit in this treaty was the intention to dismantle the welfare state and privatise public services; the US arguing that it was unfair trade that their private providers of health, employment protection and education had no access to European markets because of the state provision. Ostensibly, the intention of the treaty was to protect and regulate free-trade between nations, but its impact was designed to elevate the rights of transnational corporations above that of the participating nations; thereby diminishing democracy, human rights, protection of the environment, and preserving the wealth of those who created the organisation… those who we now call the 1%. The WTO is an important part of the triumvirate of global players undermining democracy and national sovereignty, with the US as puppet master. ARUNDHATI ROY, THE ORDINARY PERSON’S GUIDE TO EMPIRE (2004). Margaret Thatcher was instrumental in the setting up of the Uruguay round of the GATS treaty and the establishment WTO … but it was also the Thatcher government who was responsible for creating the UK roots of the current banking crisis and recession. In 1979 exchange controls were lifted; and in 1986, with ‘Big Bang’, all controls over consumer credit were abolished and housing finance was de-regulated. In concert with the Reagan administration in the US, globalization of the world’s trade and financial sectors was effected. With the advent of Globalization with its fundamentalist insistence upon open markets and free access for capital without restraints, there were suddenly no regulations to bind the Financial Class, no taxes they could not avoid and no political process they could not buy. It was a freedom from any notion of obligation, care or concern for anybody but themselves. It was a perversion of the very word freedom. They could vote wherever they chose, buy citizenship wherever they felt like it and pay only those taxes they found convenient and have no loyalty to anyone or anywhere. They were ‘free’. The charge sheet against the banks is that they have used these powers — particularly in the neoliberal era since 1980 — recklessly and in self-interest, which has done huge long-term harm to Britain’s economy…This has been a significant cause of Britain’s long-term decline… British manufacturing, the lifeblood of the economy, has been systematically hollowed out…. So what should be done? Above all, control over the money supply must be brought back into the public domain. So the Thatcher government’s policies are directly implicated in the genesis of the present situation… the intervening governments having done nothing to regulate the financial sector, and having continued the process of stealth privatisation of public services. According to David Harvey, there was a tipping point in 1987, when even the US government realised that it was not sufficiently powerful to oppose the Bond markets. (2) The capacity of the financial markets to withdraw funds from any country and cause interest rates to rise, means that the financial elites are able to act as a ‘virtual’ parliament, able to coerce governments into abandoning legislation adverse to their interests. The re-creation of the conditions of the Great depression; mass unemployment; the hollowing out of the UK manufacturing base; the north-south divide; the removal of an adequate safety net for the elderly, unemployed, sick or disabled; the recreation of a two tier provision of health and education; the lack of action on climate change or oil-dependency….and the re-accumulation of wealth back to the 1%. 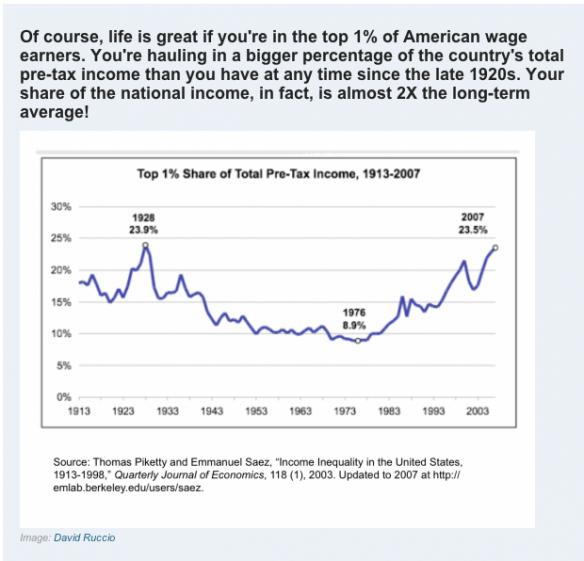 Graph 1 shows clearly how the percentage of total pre-tax income for the top 1% of US wage earners is now back at 1920 level but the same graph could be drawn for the UK. So how have the transnationals or ‘giant’ corporations not wasted a ‘good crisis’? It is a verifiable lie to blame government spending on public services for the consequences of the global banking crisis. It is solely the size of the financial sector debt which pushes up the total UK debt to nearly 1000% of GDP. The debt did not result from government over-spending but from privatisation of banking profits and socialization of their losses (5). However on the basis of that lie, the resolution of the banking crisis has been successfully redefined as a need to cut back once and for all, the welfare state and public spending. The means of imposing such austerity is by dramatically cutting benefits and the opening up of public services to privatisation… which makes no absolutely no sense in the stated policy of diminishing the structural deficit … but just happens to be the desired objective of the 1994 GATT treaty. ‘Redefinition’, secrecy and distraction are characteristic of current global politics, and it is notable that the interests of corporate power are hardly discussed in comparison to the focus on the financial markets. Colin Crouch contends that neoliberalism is emerging from the financial collapse more powerful than ever, because of a ‘comfortable accommodation’ between the state, the market and the ‘giant’ corporation. Corporate power makes it its business to bind them all together in an essentially hidden market-state-corporation triad. The moral initiative grasped by enterprises that devise their own agendas of corporate social responsibility. Democratic politics and ‘the free-market’ are both weakened by these processes. The power over public policy exercised by corporations was explored by Think Left in the case of the employment protection insurer Unum’s involvement with the Welfare Reform bill (7). This example evidences the likely similar conditions for the development of government policy in health, education, energy and agricultural policies, and indicates the vested interest of those corporations. So, Unum warns people to get insured against the cuts in benefits … of which they, Unum, were major architects …. either directly as advisory consultants, or through their funding of psychiatrists who created the intellectual framework, the funding of think tanks and academics who in turn recommend policies to the DWP, and by offering ‘jobs for the boys’. In this manner, corporations do not just exert pressure on the political process but have become major insider participants in framing the legislation according to their needs. So why are the corporations so keen to be involved in providing health, education and public services? The current shortfall of investment has nothing to do with high tax rates and everything to do with insufficient demand to meet potential supply. Cutting corporate taxes will simply make the situation worse as more wealth gushes upwards into the hands of the 1 per cent, and it goes to corporations that are letting it sit idle. 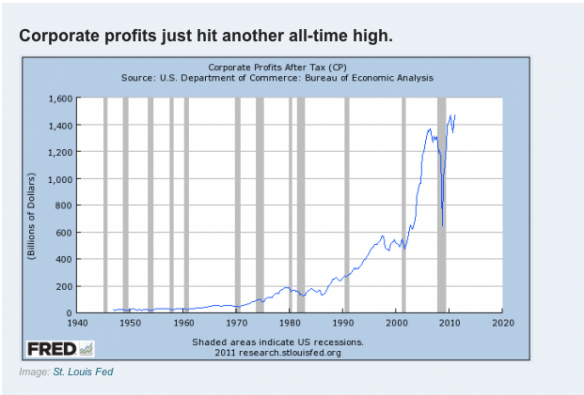 As Shaxson points out, corporate tax cuts at this stage will be as effective as pushing on a piece of string…. British corporations are awash with cash. According to Deloitte, non-financial companies held £731.4 billion in the third quarter of 2011 – the highest ever…. This is shown by analagous US data in Graph 2. For today’s financial planners the short run effectively has become the only aim. Running a corporation has become mainly a financial task whose objective is to raise the company’s stock price by mergers and acquisitions, using earnings to buy one’s own equity, arranging debt leveraging and orchestrating global intra-corporate “book” pricing so as to take profits into tax havens. Financial managers are more likely to downsize operations and scale back research and development than to expand employment and production so as to leave more income to pay dividends and interest. The economy’s debt burden is made heavier by deflationary policies that keep expansion on a short-term leash, and to encourage, rather than tax, rentier income and debt financing. In conclusion, the aim of Thatcherism to reconstitute the economic and social relations of the post-war consensus is coming into fruition under the Tory-LD coalition. This entry was posted in Economics, Environment and tagged austerity, humanity, banking crisis, GATT, Health and Social Care Bill, privatisation, The Courageous State, The strange non-death of neoliberalism, transnational corporations, welfare reform, WTO by syzygysue. Bookmark the permalink. ‘This makes clear that creating a right to supply for new private sector providers through “full competition” is a critical element of the Health and Social Care Bill.